We have much in common with wolves. Wolves have emotional lives, can experience emotions such as joy and grief. 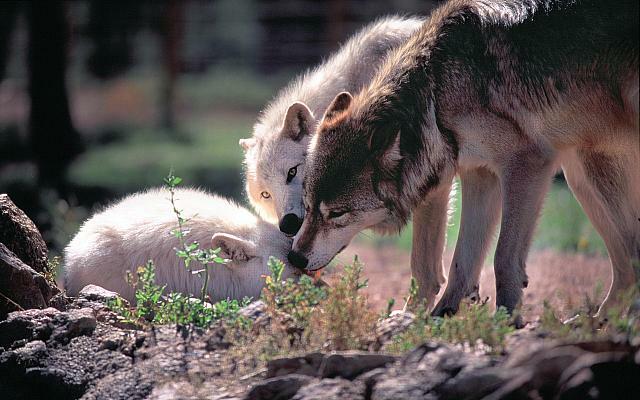 Wolves mourn lost pack members. After the death of a wolf, the remainder of the pack walk with their heads and tails held low – a sign of depression. They no longer howl as a group, but each cries in their own way. This behavior often lasts for a few weeks. Jim and Jamie Dutcher describe the grief and mourning in a wolf pack after the loss of the low-ranking omega female wolf, Motaki, to a mountain lion. The pack lost their spirit and their playfulness. They no longer howled as a group, but rather they "sang alone in a slow mournful cry.
" They were depressed — tails and heads held low and walking softly and slowly — when they came upon the place where Motaki was killed. They inspected the area and pinned their ears back and dropped their tails, a gesture that usually means submission. It took about six weeks for the pack to return to normal. The Dutchers also tell of a wolf pack in Canada in which one pack member died and the others wandered about in a figure eight as if searching for her. They also howled long and mournfully. Responses to "Wolves Feel Sadness And Grieve Like Humans "
Obviously the quality of the video isn't that clear, but I swear, at the end of it it looks like a shadow of a figure of a wolf passes directly to the right of the wolf that is being filmed. I watched it three times and it still looks that way to me. Of course, I am also a believer in animals having spirits, too, that never die. This was very sad to watch and so mournful to hear. I have seen animals that grieve more than a lot of people do! We are animals, do we not have feelings? My dogs knew what this howl meant, they all came to the side of the bed with their tails down just to listen. And, PhatMamaKat, I was glad to read your comment, because I saw the same thing and had to watch it again to make sure what I'd seen. I originally thought someone edited over something, but the wolf looks in that direction. Rather comforting, actually.. I'm glad I wasn't the only one who saw a figure of a wolf passing by the one being filmed. I know our cat mourned for weeks after our dog passed away. I got a chill when I saw that shadow. Wolves are amazing animals. So sad that some people are too blind to see that too. It too breaks my heart when I see one of my babies mourn over the loss of another. Awww.. The grieving process is rough. I was watching this video and my Husky just jumped up and started howling. If anyone says that animals don't have feelings then they are either indifferent to the animals in question or doesn't know what they are talking about. And when I watched this video and saw that shadow I thought it was my eyes playing tricks but having watch it a number of times I am convinced the lost pack member isn't lost at all but is running along side the other wolves as usual. I worked in an animal hospital & the damned greedy place actually used anesthesia on a VERY OLD dog to clean his teeth (I got fired because I was irate & vocal about it. Wrell, that ancient old lab/irish setter mix died on the table & a malamute in a cage there started howling & didn't stop. She smelled death-she knew. For the Love of God people, it is a bug doing a bat crawl across the film. You can see or read anything you want into it but lets be serious. No wonder we are not taken seriously. wolves are animals, so are we. Animals have feeling, but our brains are suppose to be developed. Oh wait, there goes a ghosts. Really??? If it was a "Bug" we would have seen wings on it I didn't see wings to each there own I guess I think it could have been a spirit. But hearing that wolf cry almost made me cry. I saw it and I wanted to cry myself. I did see the shadow & it wasn't a bug it wasn't a tumbleweed. Why can't it be a spirit, not many believe in spirits? Well I'm not the one who told the world spirits are real but millions have read it in a book. Me too so how do you really make fun of people for believing? This is incredible and moving. I too watched it 3 times and saw the shadow of the deceased pack member!!! Breaks my heart to see any animal, human or otherwise, hurt or grieve. I have had dogs all my life (50+ years) and instinctively I've always known that dogs can think, problem solve, exact vengence against their "people", laugh, love, and grieve. It seems to me that canine/lupine love is more consistent than human love..more dedicated and reliable. I suspect that is why humans seek canine championship. We are seeking trusting and unconditional love. Even poor cattle mourn their young. How can an animal have a sixth sense, and not have feelings. They are smarter in ways than any human, and YES they do have feelings.